..........Pft. This was a light-hearted conversation between me and a friend. From September 2014. Does this count on my record? Anyway, Kid Icarus Uprising ruined my old 3DS's touch screen was the point I wanted to make, and why I got a New 3DS. It's obviously related to games. Also from October 2014, according to the screenshot modification date. Nintendo has since claimed that sharing NNIDs is personal information, despite it being public. Banned for light-heartedly calling someone who came back from a ban a liar. Sarah is trouble, which is why she's permanently-banned. This was about the State of the Union 2015. Obviously I'm joking about Republicans here. I wish I was in her class full of Republicans, though. Same time as above, January 2015. This was September 2015, so I was good for 2/3s of a year. Insulting Chrom for asking if the name Chrom is foreign. 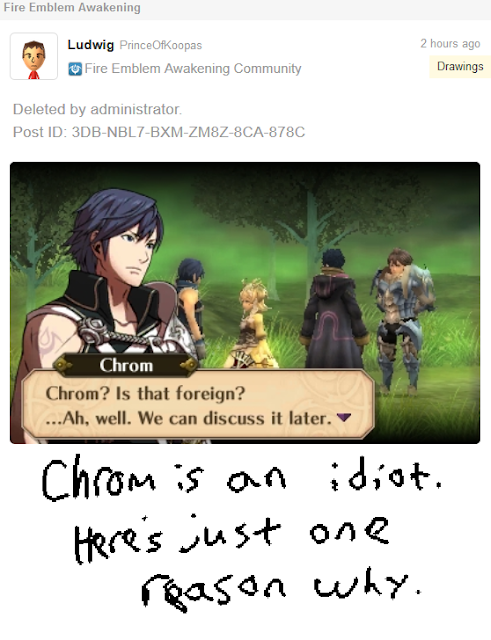 Chrom deserves insults. 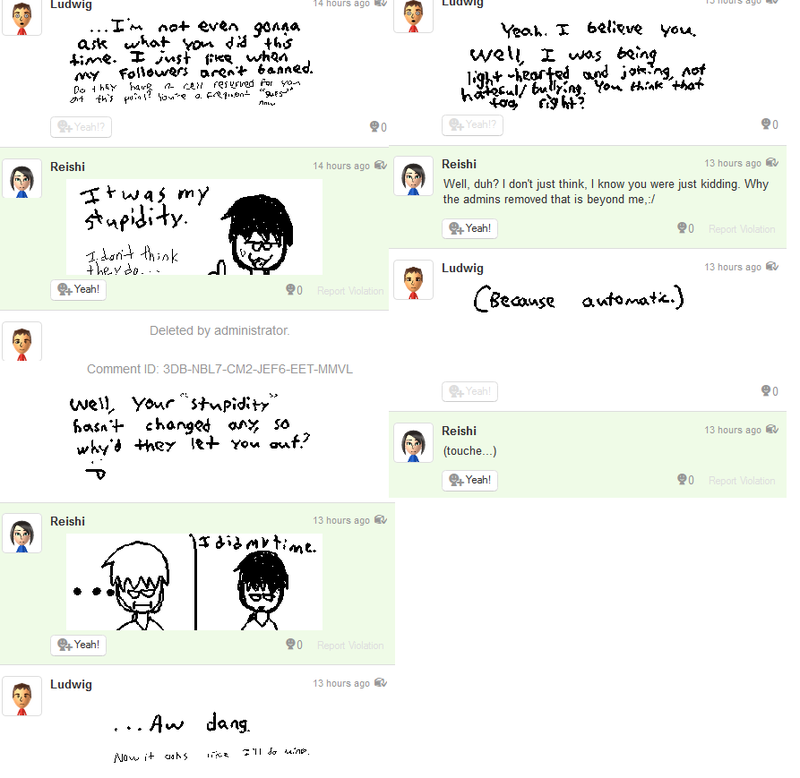 Apparently I'm bullying, so they figured out I was really insulting YoshiRider123, not just Chrom the character. This was all the way in June 2016. My hype was misplaced, since Trump's E3 conference sucked, and other conferences rated better. There were also two violations I got that were reversed. One involved me GLOMPING another user (which was already screenshotted for you in the Miiverse console ban policy article linked-to in the second paragraph of this article), and the other reversed violation involved KoopaTV's Best New Character of 2014, Foxy, from Professor Layton vs. Phoenix Wright: Ace Attorney. SO. NOW WE'RE TO THE PRESENT DAY. 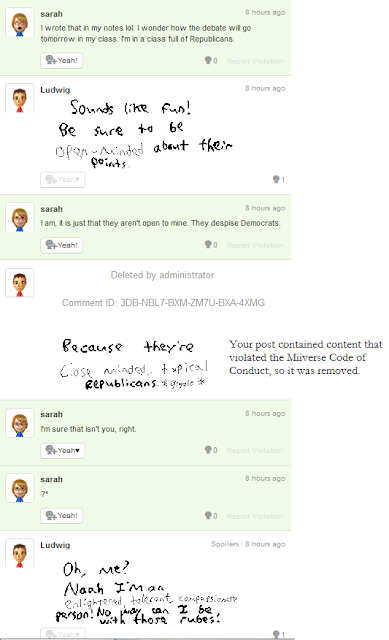 2014 was rough, but after January 2015, I've only had two Miiverse violations. I think that's incredibly impressive on my part. Post made October 3, 2016, featuring Paul Atishon. Here's a good guide on how to avoid being taken advantage of by the dishonest mainstream media. Well, it certainly sounds like something I'd write, right? 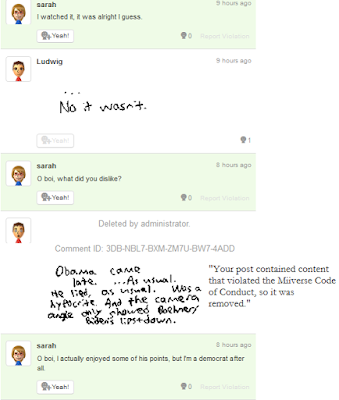 That post was in Miiverse's Phoenix Wright: Ace Attorney — Spirit of Justice community, with 20 Yeahs before being deleted. That makes it, by far, the most popular post I've made that has been deleted. In that deleted post, there was a certain user that was commenting in it. They're really dumb, and they're not banned right now (I looked), and they're probably responsible for reporting me, but I have no means to prove it. She believed I was bullying her because she doesn't know English, just a worse-than-usual form of Ebonics. Because I stubbornly don't block people, she probably reported me, and she was also questioning my own political knowledge. This was deleted for the generic reason, NOT because of the advertisement. Here's an index of the primary debate write-ups, the RNC, the DNC, and here are the general debate write-ups. The post was nominally about paying attention to politics (and turned into a Paul Atishon quotes post, now forever lost), and this belligerent user claimed that they disagreed with Mr. Atishon's/my point, and then proceeded to repeat the point, and somehow got the impression that I myself don't pay attention. As I just wrote here, she has a very troubled understanding of English, despite being from the United States. She first wanted to be my friend (“best bud”), but I told her I didn't want to have that kind of relationship with her. I didn't insult her (I was patronising, of course, but not directly), but hey, I'm a bully. and Ebonics-girl having absolutely no idea how to read it. Me telling the girl, who says she got over me and now has friends who actually appreciate her, to get off my post already, was hate/bullying her. So, yeah, bam, ban. Anyway, all of what you saw above was from over a month ago, so I kind of forgot it happened. Why would the admins have such a delayed response? I don't know. But here we are. Most of what I did were victim-less jokes (the worst kind of a joke, I admit) and wise cracks! What can a signed-in banned user do? 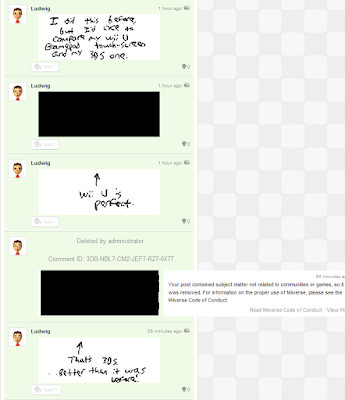 On PC Miiverse, nothing — which is why the post-ban screenshots were taken with a camera of my Wii U GamePad instead of a print screen. 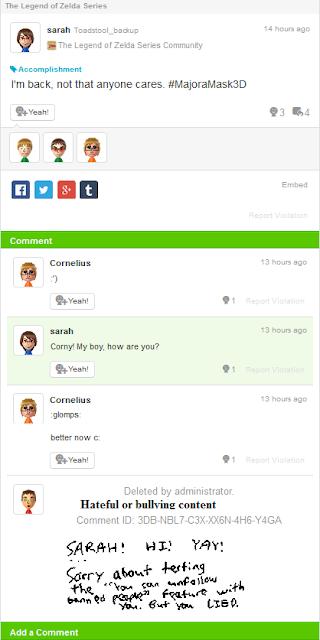 On Wii U Miiverse/3DS Miiverse, view their own profile (which is otherwise HIDDEN from the public while banned), activity feed, private messages, yeahs. They can't Yeah, Post, Comment, Message, or Follow, but they can Unfollow. They cannot add new screenshots to the Screenshot Album, but they may delete them. 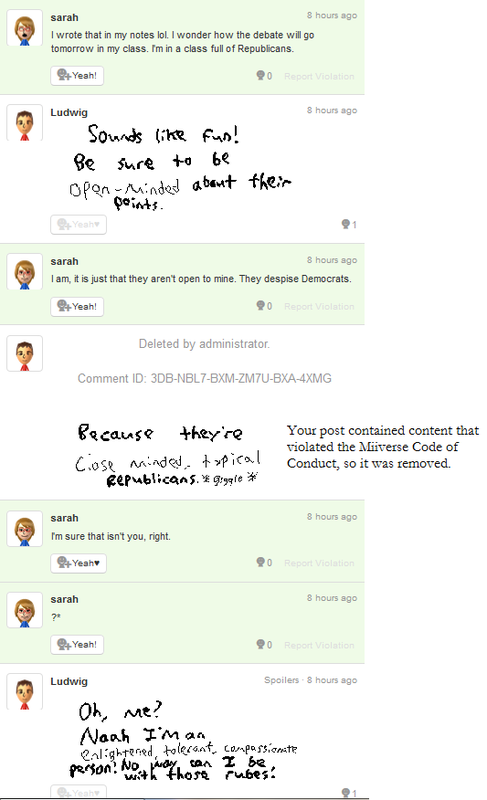 “I did not violate the terms of the Miiverse Code of Conduct. 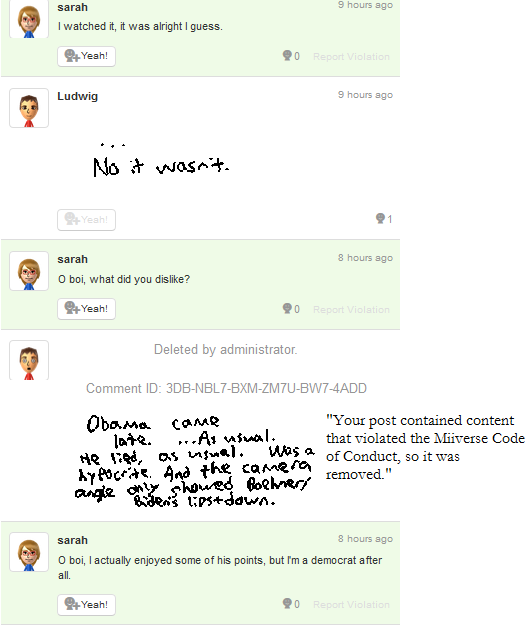 I did not violate the terms of the Miiverse Code of Conduct. ...Unfortunately, elaboration past that is... impossible. That's not a smile, Nintendo! 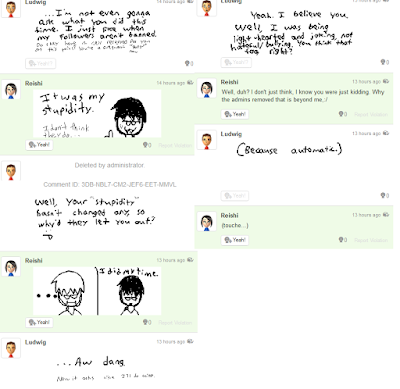 And since multiple people have already asked me this: No, Nintendo didn't do that to my Mii. 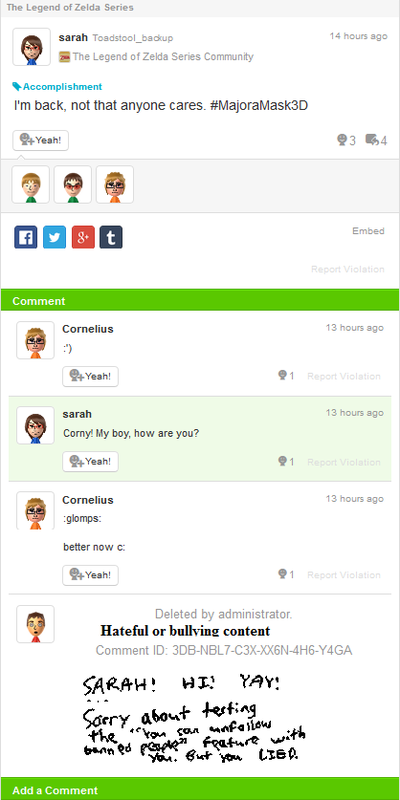 It's a custom among Miiverse users to X-out their Miis when they get banned. I decided to follow the custom instead of being my usual individualist self. I also changed my Mii's name to “B&Til12/11”, so people should be aware of what's happening. Sometimes, banned Miis change their name to “Banned” or “TwoWeekBan” or something, but no one reading knows when those two weeks started! So I put the end-date, 'cause I'm smarter than average. Hopefully, I shouldn't lose friends and followers. I started my ban with 92 Friends and 573 Followers, and am already down to 91 Friends and 573 Followers! That said, I know who that dropped friend was, and he was some Five Nights at Freddy's freak anyway, and I basically asked him to unfriend me prior to my ban. So that's not a loss at all. Let's keep that up! 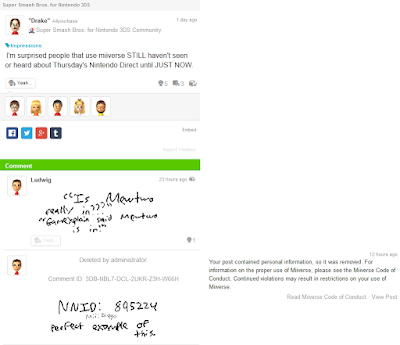 One last thing: I joined the Nintendo NSider Forums on November 27, 2003. 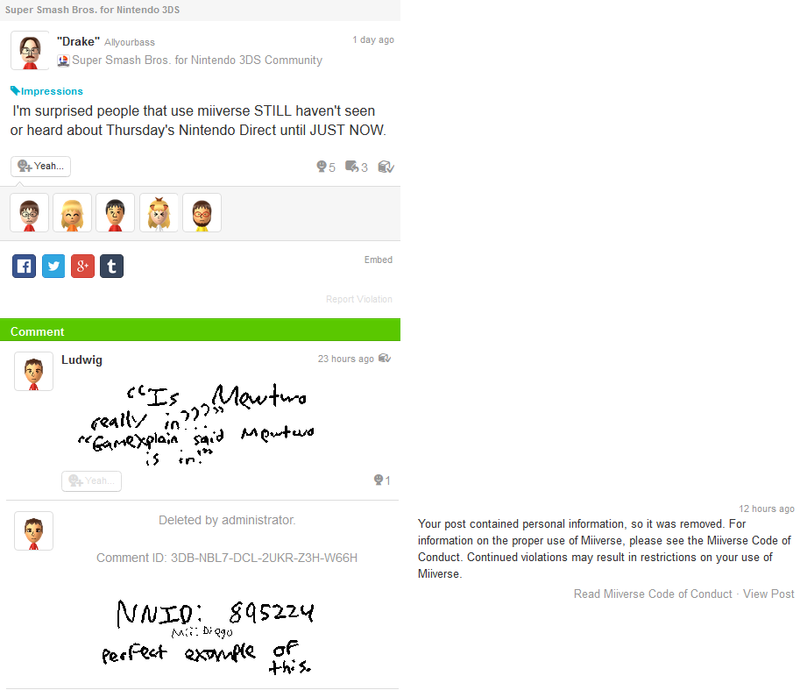 I got banned from Nintendo's Miiverse on November 27, 2016. COINCIDENCE? Ludwig hates learning behavioural lessons, but he'll consider saving political innuendo/tangents for KoopaTV articles, rather than Miiverse posts. That said, there is a lot of innuendo that Ludwig has posted that is untouched, so the admins have enough material on Ludwig to keep him locked up for life. So if anyone wants to organise some kind of jailbreak, let Ludwig know in the comments section! 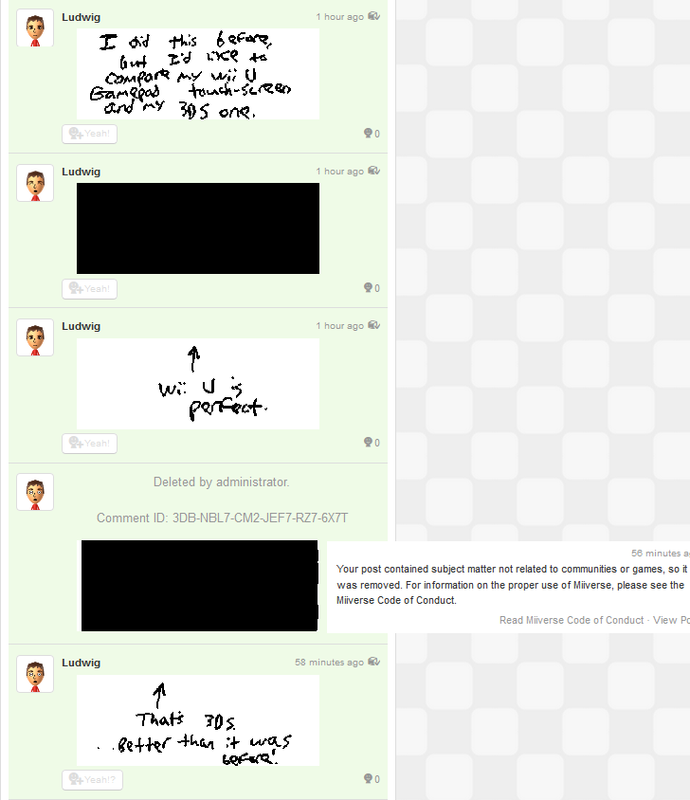 Here is the article about when Ludwig first got banned from Miiverse, two and a half years ago. I have been getting posts deleted lately. Those posts were nothing about my pregnancy though. The first time was probably because typing the word "hack" triggered it. For the others, I avoided writing Trump's name but still got posts deleted anyway. What, even innocent wittle Girafarig is getting in some trouble? Soon the admins will be targeting impersonation accounts. At least you're the real Ludwig von Koopa, right?